Rated U. Universal. Suitable for all. This is a Yesh Raj films brand of the Hindi DVD. Has the UPC Code 8902797600024. Has Yashraj Seal. Anamorphic Widescreen. 165 minutes Color. Dolby Digital 5.1 Sound. NTSC FORMAT-ALL REGIONS. Feature Film & Special Features: Feature Film in Anamorphic Widescreen Presentation. 5.1 Dolby Digital Sound. OPTIONAL SUBTITLES IN 7 LANGUAGES. ENGLISH/TAMIL/TELUGU/KANNADA/MALAYALAM/GUJRATI/BNGALI. Original Theatroca; Trailor. Produced & Directed by: Yash Chopra. Music: Khayyam. Lyrics: Sahir Ludhianvi. Starring: Amitabh Bachchan, Rakhee, Shashi Kapoor, Waheeda Rehman, Rishi Kapoor, Neetu Singh & Introducing Naseem. Release Date: 1976. Buy Kabhi Kabhi- Love Is Life (DVD, 1976), sold & shipped by Movie Time Video where you can shop online for Pooja Mandir, Bajot, Gifts, Hindi Movie DVD / CD, Music Video. 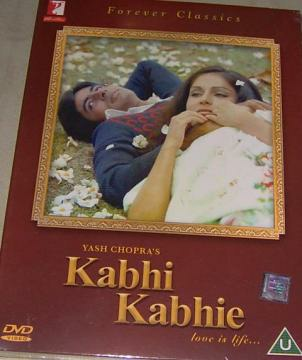 This Amitabh Bachchan Film collection has been tagged as ER9 1 sam NEH 7.00 14.93 amitabh bachchan rakhee shashi kapoor. I appreciate your diligence on this matter. You have provided excellent customer service!